I thought it was appropriate to start this blog with recalling how I got to where I am now. In this, I simply mean how I ended up with an allotment, how I came to be planting what I am now in pots on the balcony and what I have learnt so far. This is what the next few posts are likely to be focused on. I suppose it started with an interest in trying some gardening, and our opportune moving into a flat with some (although not much) outside space. The small balcony provided a good platform for me to begin growing ‘a few’ plants and I recommend everyone with some outside space in which to put pots, does so. Don’t just stick compost or soil into a pot and hope. You need to add some form of crock. 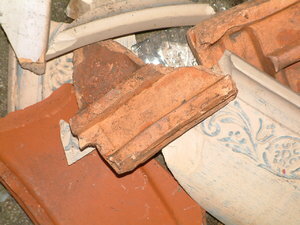 All this means is something such as stones, broken bits of pot, chunks of polystyrene etc in the bottom of a pot to aid the drainage of the soil on top. It doesn’t have to be a big layer (about 1/2 inch or 2-3 cms) but is necessary. If you don’t? 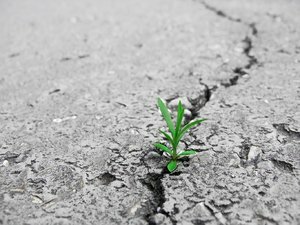 The soil doesn’t drain well, it becomes waterlogged and essentially will rot the bulbs or roots of a plant. Don’t over-water. Or you will have the same outcome as above – waterlogged plants. Think for a minute, would you try and plant your bulbs in a puddle? If not, don’t try and create a sludgy puddle in the pot. Depending on the conditions, watering a pot every 3-4 days is sufficient in the cooler temperatures, and maybe once a day or once every couple of days in extremely scorching weather. This really depends on how wet the soil is, and how the plant looks – a bit of common sense here is needed (something which apparently eluded me!). 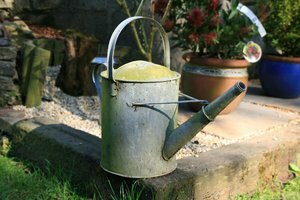 Everything in moderation – not a whole watering can over 3 plants. It is just too much…apparently. 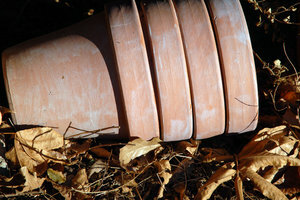 Don’t over-firm the soil / compost in the pot. If you do, how is the water you are pouring on it meant to get to the roots? How are the roots meant to spread and establish if they are facing a concrete-like density of soil? By the same token, you do need to firm it into the pot a little, or each time the wind blows you will end up with the plant being ripped out of the pot, moving around too much and sadly, damaging the roots. But I suppose most of all, despite the above, don’t be afraid to give things a go. You won’t kill a plant if you put too much water on it a couple of times, or if you forget to water it for a day or so. It won’t suddenly fly off in the wind if you don’t firm it quite enough, and won’t just die overnight if its too firm. You will be able to gauge this from how the water is taken into the soil. The plant may start to droop or look a little off-colour, but it is usually salvageable. This entry was posted in History and tagged balcony gardening, broken pots, crock, don't forget gardening tips, don't kill your wife's favourite flowers, don't over water, firming up soil, gardening mistakes, improving drainage, oops, patio plants, pot plants, underwater. Bookmark the permalink. ← What is it all About?